Wouldn't we all love to wear designer every second of the day?! At least I would. However, realistically the chances of this happening, unless you are flourishing in finance, are little. I like anyone, admire catwalk fashion, the hottest seasons trends from the world renown designers but that does not mean they jump straight into my wardrobe. The Key: As I always say in my blog posts you will find an alternative to designer clothes on the high street with a similar design, pattern or shape; this is no word of a lie. I love to dress up as much as anyone, nothing makes you feel better than looking glamourous and feeling fabulous which I usually find in a perfect ensemble paired with the hottest heels. Personally I invest in quality outfits and spend the money rather than going directly to the cheapest stores on the high streets. There is nothing more satisfying than looking at photos from a night out and seeing how good you really look (although no one likes to brag about it)! 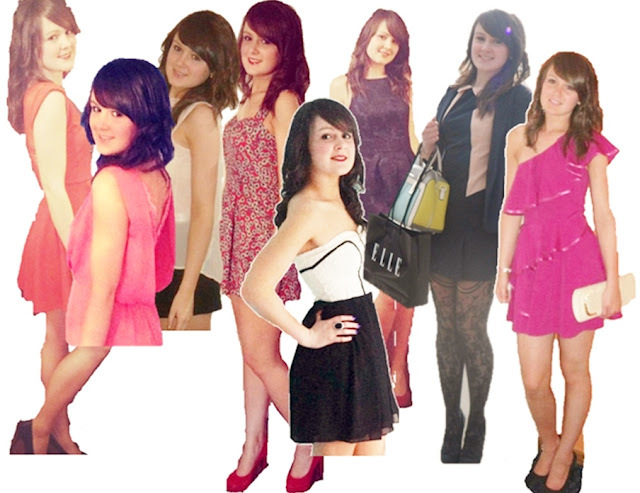 Here are some of my favourite looks from nights out and every single outfit is from a high street store (above). Who said classy and fabulous was solely in designer ensembles? As long as you feel good about yourself you will dazzle. Affordable fashion that you have taken the time to pick out is worth more than something you would wear because of the designer label. A great value wardrobe is a quality wardrobe. What is most important: Do not degrade yourself just because you do not think you can afford to look fabulous. If you invest in signature pieces that you'll love from the very moment they catch your eye you know they are worth it. With outfits like this you can also re wear them, if you looked chic the first time round you will look just as good, if not better the second time round! Outfit repeating is not a sin, it is better than wearing clothes that lack character, sophistication and quality. Maybe one day we'll all be able to have wardrobes overflowing with designer outfits but for now this is the key to looking your best! I wanted to take a moment to welcome you to Independent Fashion Bloggers. I hope you enjoy the site as much as I do. It’s a good resource and dynamic blogger community.